In my own words, I used to be a complete “peanut-butter head”, eating about a jar a week on everything, from sliced apples to porridge. The thought of being without a jar filled me with dread, so much so that I would take it to hotels when I was working away. And yet, I haven’t even fancied any in weeks, possibly months. What changed? Bianca: There’s a difference between like and love. Because, I like my Skechers, but I love my Prada backpack. Chastity: But I love my Skechers. Bianca: That’s because you don’t have a Prada backpack. Like, I like peanut butter, and I thought I loved it, until I found true love with a sesame paste, of all things. I’m not the only one who thinks it’s marvelous – this week it’s the “Good for You” food of the week in the Guardian and Yottam Ottolenghi would probably rather go without water than tahini for a day. We’ve talked about the health benefits here, too. Protein, minerals, vitamins, and it tastes darn fine. Whip up a batch of this dressing and keep it in a jar in the fridge. 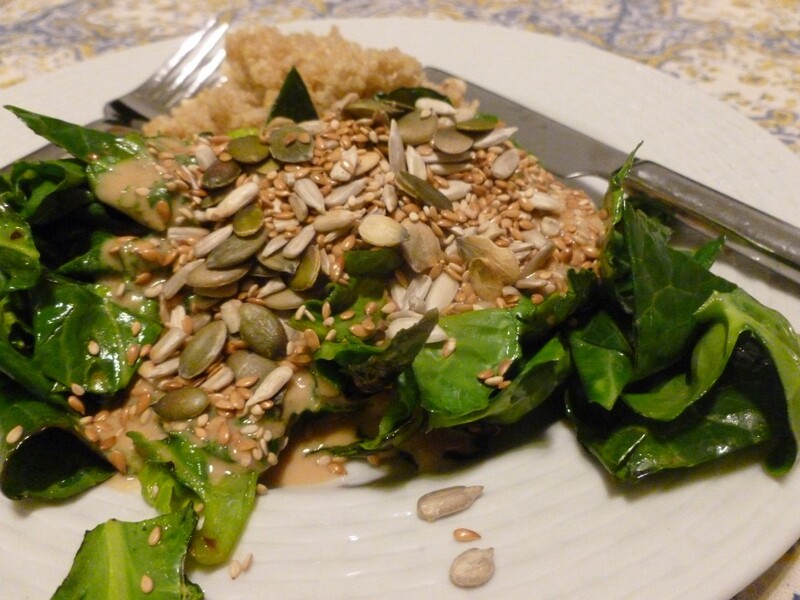 It works well as a dressing over raw spinach for a salad, or steamed or stir-fried veggies. As in the picture, all it takes is some grains and some toasted seeds to make stir-fried greens a substantial, tasty meal. Be aware that traditional miso contains dashi, which is made from fish so isn’t vegetarian. Check the label – most of the miso sold in health food stores and lots sold in supermarkets is fish-free. Makes a couple of servings of the dressing, depending on how much you want to drown your food… Scale it up and make a jarful. Mix all of the ingredients in a jar and shake. Add more warm water as needed until it is a pouring consistency. “The thought of being without a jar filled me with dread” – this is me! I am obsessed with peanut butter, but I will try tahini and see how I go! How does it compare health/fat/nutrient wise with peanut butter?